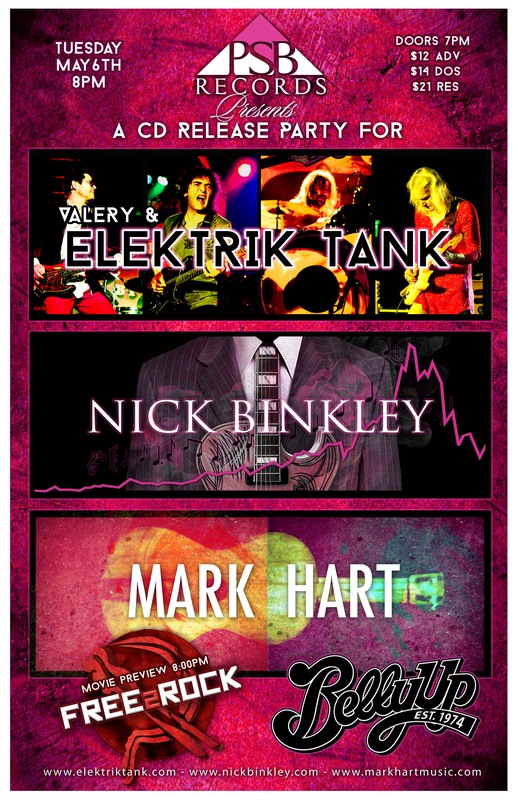 San Diego based independent label PSB Records is set to host an exciting triple CD release party headlined by Valery and Elektrik Tank with singer/songwriters Nick Binkley and Mark Hart of the famed band Crowded House. The artists will be performing selections from their latest label recordings. Binkley will be sharing pieces from his poignant 100 Parts of Heart, while Valery and Elektrik Tank will be playing tracks from Go Go Boom Boom (see video “Red Hot Lipstick”) and Hart from The Backroom. The evening will also feature a preview of the PSB-produced film “Free To Rock”, a powerful star studded feature length documentary film, directed by four time Emmy winning filmmaker Jim Brown, which explores the previously untold story of how rock and roll contributed to the end of the Cold War and the collapse of Soviet Communism. Binkley’s hands on involvement in the creation of the nine year-in-the-making documentary film produced in collaboration with the Grammy Museum, the Rock and Roll Hall of Fame and the Stas Namin Center of Moscow, stems from his decades long involvement with Russian rock musicians. A meeting in 1977 with Russian singer Valery Saifudinov (now frontman for Elektrik Tank), who had founded the first rock and roll band in the former Soviet Union, led Binkley to support the first wave of Soviet rockers allowed to emigrate to America in the mid-70s. These musicians would later become Binkley’s band (Nick Binkley & The Street Dogs), recording and touring with him in Russia and appeared with him on Russian national television and radio. That band also provided the musical foundation for the recording and live performances of his earlier albums Pin Stripe Brain and Let The Boy Jam. Saifudinov is also one of the engineers and producers on 100 Parts of Heart. All proceeds from the sale of 100 Parts of Heart and licensing of its songs will go to benefit the Diana Padelford Binkley Foundation (“The Diana Foundation”), established in 2004 as a charitable institution focusing on women’s health issues, pain management in women, and the potentially dangerous adverse side effects of high dose steroid therapies (www.dianafoundation.com). For more information, please visit www.bellyup.com/event/psb-records-cd-release-party, www.psbrecordsinc.com and www.nickbinkleymusic.com.